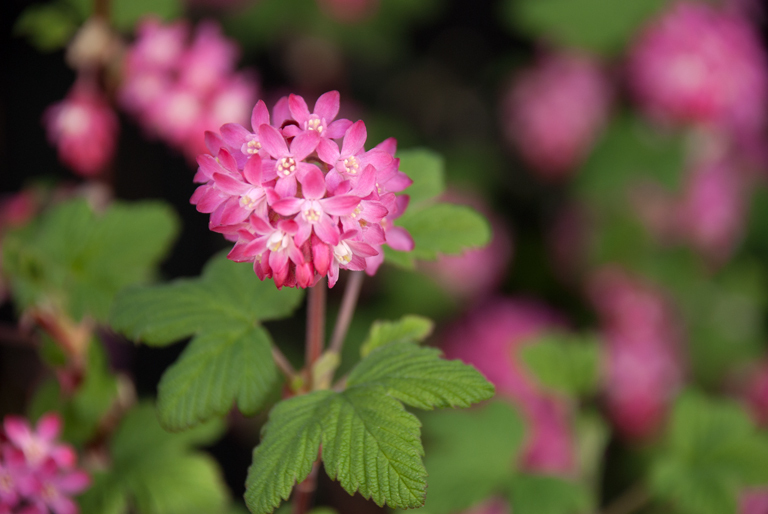 In this month’s Garden Flowers blog post which I write with blogger and freelance writer, Rona Wheeldon, we’re looking at perhaps one of the lesser well-known garden plants, the flowering currant. Resembling the fruiting blackcurrant, it’s a wonderful addition to your garden at this time of year if you’re looking to add some colour. They look great under planted with spring bulbs or perennials such as geraniums and, later on in the season when the flowers have finished, they can be used as a climbing frame for honeysuckle or summer-flowering clematis. Its Latin name is Ribes sanguineum and there are several different varieties, the more popular ones being ‘Pulborough Scarlet’ (pictured) and ‘King Edward VII’ with their dark red flowers. There’s also a white flowering variety called ‘Tydeman’s White’ and a pale pink variety named ‘Porky’s Pink’. 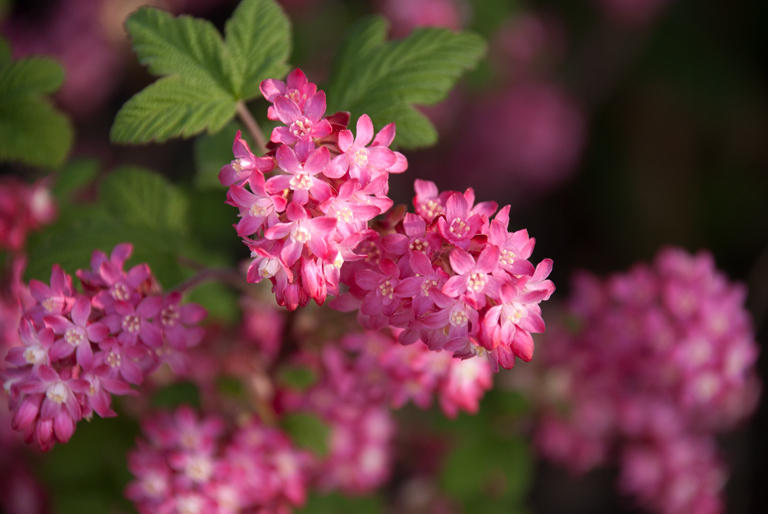 The flowering currant’s peak season is usually March to May and the blooms themselves are pendulous highly scented clusters of tubular flowers. As a hardy shrub, it makes a good informal hedging plant and it blossoms every year without any special care needing to be given. However, for it to perform at its best, it’s worth cutting the branches that have flowered back to a strong pair of buds just after it’s bloomed. 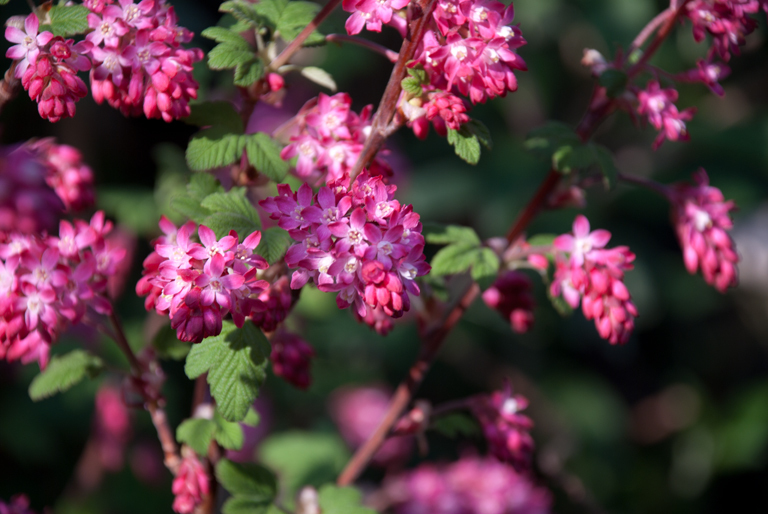 All flowering currants have a pungent scent that is stronger when the dark green foliage is rubbed or brushed against. They like to be in the full sun in moderately fertile and well-drained soil. 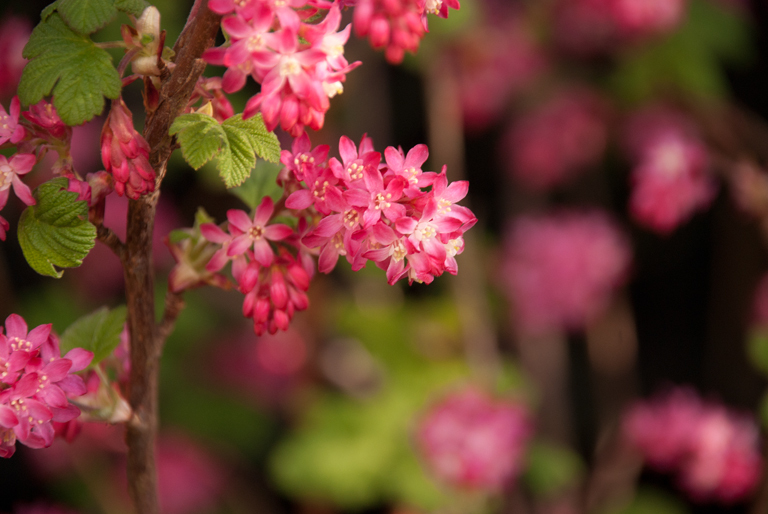 I love Ribes, it reminds me of Granny’s cottage garden. I discovered a beautiful white Ribes at Spring Reach Nursery in Ockham, Surrey which smells just as gorgeous as the red version. One of my favourites too – really easy to grow and looks spectacular at this time of year! Brilliant! You have helped me identify the beautiful raspberry coloured plant currently flowering in out garden. Very pleased to read all about it. Beautiful and the bees love it! Glad to be of service Rosie 🙂 – the flowers seem to be in abundance this year don’t they – the burst of summer last week really brought everything on quickly…hope the frost this morning doesn’t kill anything off! Yes, they are especially good this. 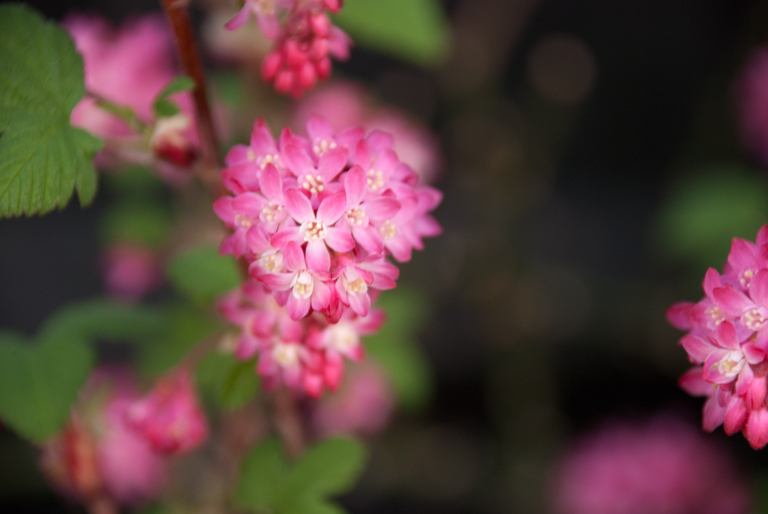 Great to highlight this shrub because it is common, but there’s a reason – it is such a good performer. recently put King Edward into a listed edwardian garden on the basis that it fitted! My flowering currant is losing it’s leaves in July. Is this normal? Hi Sarah. No it’s not normal. How long has it been planted? Last year we planted my first garden ever. 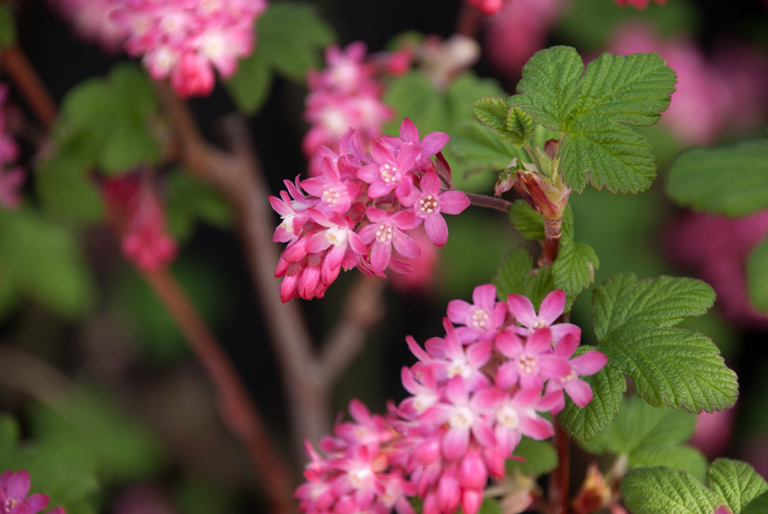 One of the plants I wanted was ribes, because of the small pretty flowers, and particularly for the strong-smelling leaves which many people don’t like. Our garden designer friend brought a ribes. We planted it, and it’s grown huge. But it doesn’t smell strongly. I can only guess that it’s the wrong sort. I’ve kept the labels of all the plants we put in, but I can’t find the ribes, so I don’t know which sort I’ve got. Please can you help? Mine is becoming a big tree, whereas I was thinking of something smaller and bushy. Email me a picture if you like (lisa@lisacoxdesigns.co.uk and I’ll see if I can identify it. 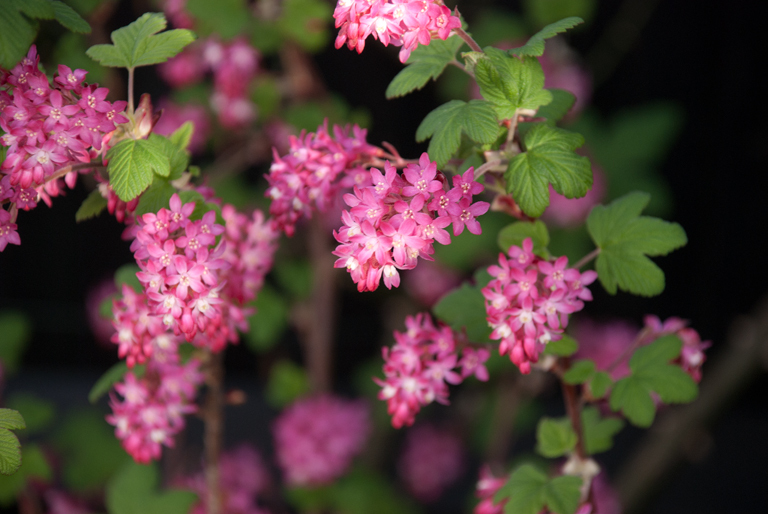 Ribes sanguineum grow to height of 1.5-2.5 metres but you can keep it pruned back if it’s outgrowing it’s space. Cut back the flowered growth, immediately after it’s flowered, to strong young shoots lower down. It’s also a good idea to cut out 20% of ageing stems near to the base each year. My flowering currant tree is losing all its leaves early August. I may not have gotten enough water but can you advise me. Leaves are brown then fall. Thanks!!! Hello Wendy. It might be lack of water but if it’s been planted for some time I would have thought this is unlikely. I’m not really a plant disease expert so your best bet is to look at The RHS website which is an excellent resource (you can also ask an expert) https://www.rhs.org.uk/advice/plant-problems.